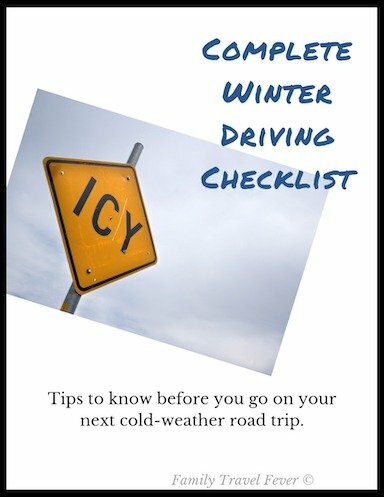 Before your next cold weather road trip, you need to be prepared and know these tips on winter driving! Included in this list of winter road trip essentials are vehicle safety inspection, cold-weather preparation and packing, emergency roadside kit, and tips for driving in the snow. Have a mechanic ensure your car is in optimal condition and go through a vehicle safety inspection checklist. Your mechanic should perform a tune-up. Change the oil, if its time, and top-off the reservoirs with cold weather fluids. Have the mechanic check the battery for voltage, amperage, and reserve and replace the battery if necessary. Batteries are less efficient in cold weather. So a bad battery will become a dead battery quickly. Check the lights and blinkers are working and for brightness. Winter weather makes your lights and much less visible. If the windshield has a small crack or star make sure to get that fixed or replaced before leaving in freezing conditions. A small crack runs quickly. We like the Rainex wipers here but make sure to measure the length before ordering new ones. Expert tip: turn off the windshield wipers before turning the car off. If the wipers do not return to resting position, they may freeze to the windshield. When you turn the car on, the wipers will be trying to return to the bottom and the motor can actually burn out before your car is warm. 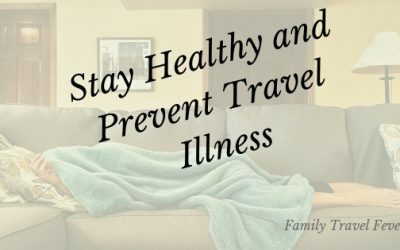 Caution: Are You Prepared for Winter Travel? Get Your FREE Copy Now!! Receive the Winter Driving Checklist as a FREE gift for signing up for the newsletter. 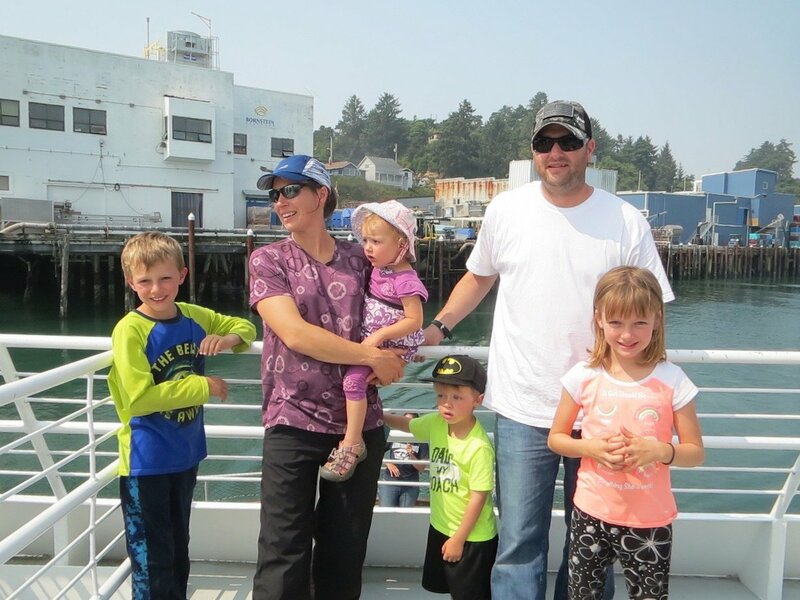 Plus, you will receive inspiration and tips to launch into your next family adventure. Check the age, tread, and inflation. Here’s a lesson in physics – when the temperature drops the tire pressure also drops. You don’t want start out with under-inflated tires and end up with flat tires. Make sure they’re filled to the manufacturer recommendations. Good all-weather or snow tires with sufficient tread are necessary and sometimes required by law. Through I-70 in the mountains, Colorado enforces a traction law during winter storms. If you don’t have snow tires or all-season tires, have them installed before you leave. The NHTS a recommends 2/32 inch of tread and Colorado traction laws require 1/8 of an inch of tread. Inspect your tires for even wear and sufficient tread. Also, even if your tires seem to have good tread, check the age. This happened twice to us on trailers (yeah, slow learners here). The tread looked great but the tires were old and blew after driving a couple of hours. Plan your route, have the information about the roads you will be driving and tell someone where you are going. Make a plan to check in with them throughout your journey. I can’t tell you how many times I’ve left the house in a hurry only be stuck in the snowstorm. Weather moves in quickly in the mountains. So be sure to check a couple days out and then be prepared in case weather moves in early. I have been stuck on a highway that is closed with no place available to stay. I could have changed my trip to be at home waiting out the storm or taking a different route had I been watching the weather and checking road conditions. You should carry basic snow supplies, as well as supplies to help in case of an emergency, in your vehicle. Before setting out on a winter road trip make sure you have a long-handled brush and scraper to clear the windshield. I keep one like this in my car. Every autumn as winter sets in, I find myself trying to warm up the car and scrape my windshield with my library card. Fortunately, I am usually at home, and my fingers take enough of a beating that I remember to buy a scraper. Stock an extra gallon (or two or three) of winter grade windshield washer fluid. The mag chloride sprayed on the roads is like a sticky mess on your windshield. You will go through more fluid than you can imagine. Always drive with at least half tank of gas in case of traffic jams, slow winter driving conditions or an outright stop on the highway. *Pro tip – Do not rely on your “miles till empty” notifications, especially if your tires are bigger than the stock tires. The manufacturer calibrated the odometer based on the circumstance of the stock tires. Larger tires will make the odometer and therefore the “miles till empty” calculation inaccurate. I know because we ran out of gas before that occurred to me. Make sure to have tire chains with you in the car in case of icy and snow-packed roads. Know yout tire size before buying chains. We use self tightening chains similar to these. Not only are chains a good idea, some stated such as California may require all vehicles use chains in winter driving conditions. Pro-Tip: Practice properly installing the chains before you need them. Embarrassingly, I borrowed Charles car one time and couldn’t get the chains on. Fortunately, I was a small side street in town and was able to maneuver to another street. On a winter road trip, you may find yourself on the highway with a chain law in effect. You will need to pull over to the side and install your chains in the snow with everyone else. You should not overexert yourself trying to dig your car out of a snowbank or pushing your car out of a ditch. However, you can get your car going in the right direction with some traction supplies. You will be happy if you are successful at getting back on the road again. Pack a snow shovel, broom, ice, and sand or kitty litter. The sand or kitty litter will give your tires enough traction on icy spots. An important tip on winter driving is to be prepared with an emergency kit. Have some supplies on hand in case of emergency or if you are stuck and waiting for tow truck. You can buy an emergency roadside kit with will include first aid supplies or assemble one yourself. This emergency roadside kit will cover most of the emergencies that you will face. At the least, keep jumper cables or a jump starter pack, flashlight, safety vest, and emergency markers and flares in hand. Your emergency preparations should include supplies to spend the night in your car. We keep sleeping bags, down wool blankets, and extra food in the car. Our backpacking sleeping bags pack down so small that we keep them under the seats and the kids cover up with small down throws from Costco. Keep extra food supplies like food and water on hand in case you are stuck on the road past a meal or two. Think high-calorie food that is compact, won’t spoil and palatable. Fortunately, peanut butter and chocolate fit the criteria. Other foods that I suggest are nuts, beef jerky, salami, dehydrated fruits, GORP, beans, and tuna pouches. Even if you do not expect to play in the snow at your destination pack warm clothes in the car. Getting stuck for hours or overnight is a real possibility when traveling in the winter. I pack a water proof duffel bag full of snow clothes. Hopefully, you’ll just need these to get out of the car and play and not because you are stuck. Just because it’s snowing doesn’t mean the kids won’t get restless in the car so have that snow gear on top in the trunk. I stop, gear everyone up with snow clothes and send them out to play. Expert tip: when you’re loading back in the car I layout a waterproof picnic blanket to strip off jackets, snow pants, and boots. We have a clean place stand in socks before hopping back in the car. Then I roll everything up and throw back in the car. Tip: This works great for snow and sand both. 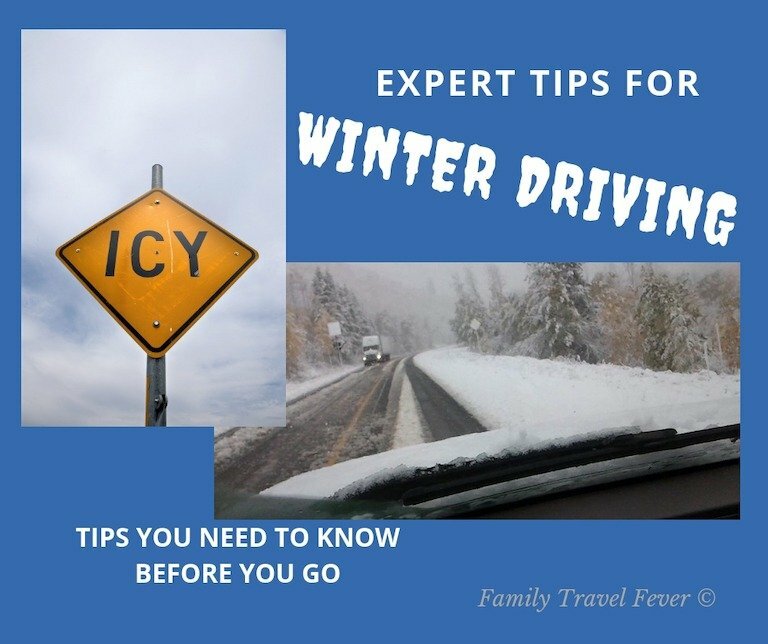 You need to know these tips for driving in the snow so you will be prepared if you end up traveling on icy roads or through a snowstorm. If the ground is slushy, snow-packed or icy, shift into 4X4-high, generally a button on your dash. When 4 wheel drive is = in engaged, all 4 tires are engaged to move the vehicle forward (or backward). That does not necessarily mean you have more traction to stop. In the mountains of Colorado, people know that 4 wheel drive becomes 4 wheel slide when stopping on ice. Starting off on an icy road can be difficult and trying to accelerate fast will only make the tires spin. Accelerate slowly to gain traction. Likewise, decelerate, but letting off the gas, slowly to avoid sliding or fishtailing. With anti-lock breaks press the brake firmly and let the breaks pulse on and off to stop. In an older vehicle, without anti-lock breaks, you must pump the breaks yourself. Give yourself a long distance to stop and continuously press and let go of the breaks. Keep going slow and steady. Before going uphill keep your momentum to move the car up the hill. Once on the hill continue slow and steady, don’t power up the hill. The tires will start spinning and you will just slide sideways. And don’t slow down or stop going up a hill, if you can avoid it because you may not get going again. If you do slide, let off the gas, and slowly correct. Be cautious and do not to over-correct. If you encounter animals on the road, do not swerve. This rule applies on dry pavement but on icy roads you are much more likely to lose control of your car. You don’t need your full ski gear and snow pants on (keep them in the supply bag) but you should dress warmly in the car. You might be tempted to put the kids in lightweight jammies at night because the car is warm. However, A couple of layers and footie jammies is a good idea in case of emergency. Seatbelts and car seats are required by law but you may get tempted to be a little lax on this on a long road trip. Winter driving can be hazardous so make sure you buckle up and everyone is safely in their seats. Sit up straight with the shoulder belt resting on your shoulder. Have the car seats installed correctly before driving. Check NHTSA’s child passenger safety recommendations. This car seat is the one we use to get 3 across in a small car. In addition, although not required by law, I use boosters with side impact protection for kids on long trips. The high back boosters hold the kids heads upright when they sleep and hold their bodies in a safe position in case of an accident. In an emergency do not, I repeat do not, leave your car and venture into a snowstorm unless you’re in a very unsafe situation such as on railroad tracks or balanced on the edge of a cliff. The “I shouldn’t be alive TV series” had a couple of episodes where people left the car. If you do stop, bundle up have some snacks and stay hydrated. Place the bright markers and flares out so emergency workers can see you and calling on your phone. If you don’t have service, check if your GPS will send an emergency notification on your cell phone or GPS device. If you do need to run your car, make sure the tailpipe is clear of snow or debris. The NHTSA advises running your car and heater intermittently to avoid carbon monoxide poisoning and a asphyxiation. The most important point, especially with kids, is due not panic. If you panic, it doesn’t help the situation and the kids will be even more nervous. Be gentle but firm with your instructions and reassure them. 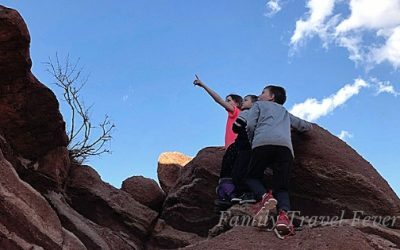 We have found our kids are cooperative and understand problem situations but, if we are calm or even playful, they are generally unfazed by the stress. Know you know the best tips to be prepared for winter driving conditions for your next road trip. Don’t forget to have your vehicle serviced and pack the winter road trip essentials listed above. Practice putting on tire chains and maneuvering in the snow before you are caught in a storm. Please, pass these safety tips along to someone you know headed out on a cold-weather road trip. These are essential tips for winter driving and I want everyone to learn from my mistakes – so you don’t have to make them too! Please let me know in the comments if I missed any great advise because I want to make sure this is the most comprehensive list for safety on winter roads. These are great tips! I live in New England and we’re gearing up for winter here. I’m going to use this post to make sure that I’m good to go. Also, I always forget to turn my windshield wipers off before I turn the car off. I need to find a way to remember that this year! The roads in New England get so icy! I hope you find the 6-page checklist helpful. I included tips I didn’t find elsewhere but have been so important for me. A very sensible and smart approach to winter driving. Thanks for sharing these tips! Your welcome. I hope the checklist helps too! I lived in Alaska for 10 years and had got plenty of experience driving in snow. These are all great and very useful tips, and ones I have used myself. Another important tip is to not slam on the breaks, which is what your reflexes will tell you to do, but all that does is make you slide across the ice. Instead, you pump the breaks, so your tired can get more of a grip on an icy road. Yes, thank you for adding that. Yes, slamming on the breaks will send you sliding, especially if you don’t have ABS. These are all very good and sound tips. We made the mistake of leaving once without checking the weather forecast and had the horrible experience of getting caught in a blizzard. And then we made it worse by not turning back right away and thinking it would be over soon. After six hours of terrifying driving and sliding all over the road, we finally cleared the storm.I kept thinking we were going to end up in a snow bank without proper supplies. We were lucky but not prepared at all. Yes, getting caught in a blizzard can be so scary! When I am prepared to spend the night in the car, I feel much more confident and calm. Wow, what an awesome and detailed post. Realizing how unprepared we are for snow driving. I also love your “year round” tip about the size of your tires affecting your “miles till empty” display. Never thought about that…. Thanks. I’m glad you can learn from my mistakes. The checklist is 6-pages to help you prepare before leaving home and tips during driving. Thanks for the tips. 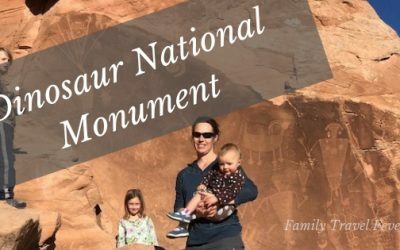 Now that I live in a warm climate, I sometimes forget all these things that need maintained…especially when going on a road trip up north. I like the ruler shot, great way to check your own tire treads. Thanks. I am happy that it is helpful. It so easy to forget! Seems like I am always surprised by snow in the high country.